As I had written about previously (here and here), the Waterbury, CT AA minor league team was affiliated with the Dodgers from 1973 to 1976. A minor league set of the 1975 team can be found at very affordable prices on eBay, but most of anything else can be next to impossible. Dodger related memorabilia from this time period can be very hard to come by. That's why I am fascinated by the below auction item I stumbled onto recently. 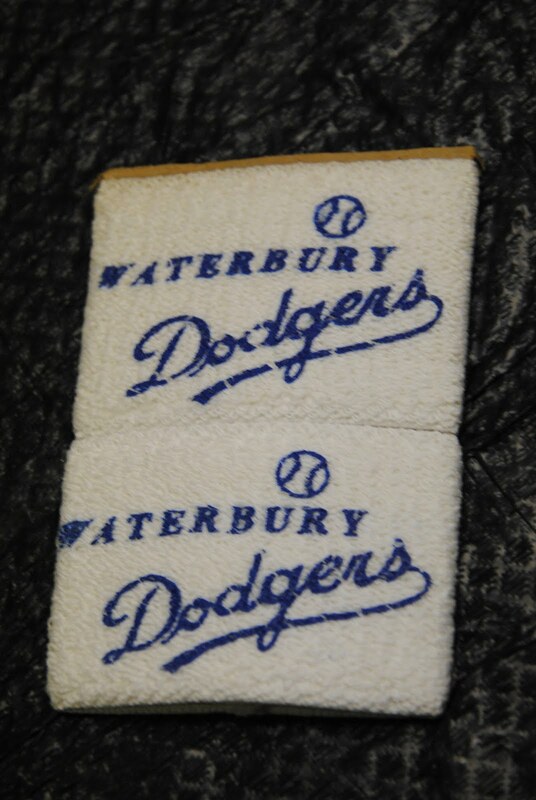 It is a vintage pair of Waterbury Dodgers wristbands. 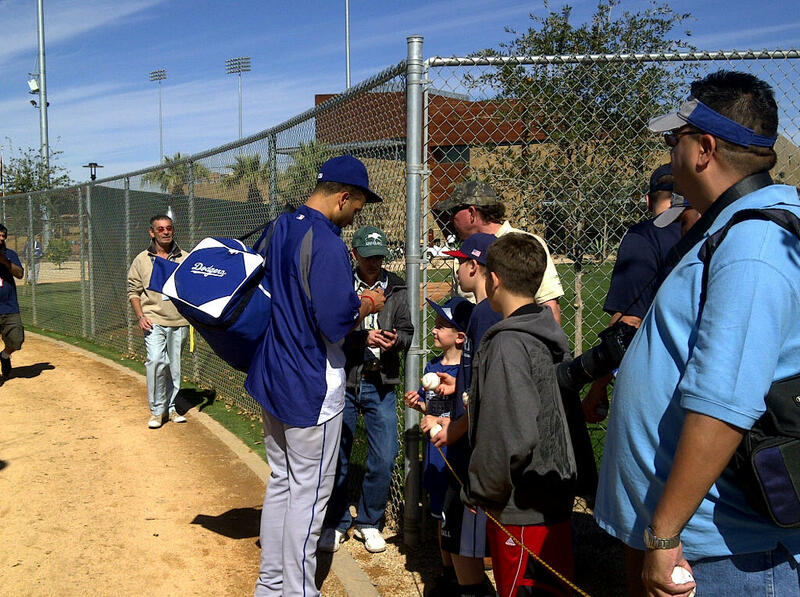 Here are todays Spring Training Notes from the Dodgers. Also, here's todays lineup against the KC Royals: lineup vs. KC: Carroll 3rd; Navarro C; Ethier RF; Kemp CF; Kapler LF; Loney 1st; Gibbons DH; DeJesus 2nd;Castro SS; Redding RHP. PAINT THE TOWN BLUE: The Dodgers and Royals will meet for the first of two games this spring with a split squad of Dodgers making the short drive to Surprise for a rematch on March 12. The two clubs split their two Cactus League contests last season and have not met during the regular season since 2005, when current Dodger non-roster invitee Mike MacDougal picked up two saves during the Royals’ three-game sweep at Kauffman Stadium. STARTER SWAP: Tim Redding will make his second Spring Training start after tossing 2.0 scoreless frames on Saturday against the Giants. Ted Lilly was scheduled to make the start this afternoon, but was scratched due flu-like symptoms. Redding will be followed to the mound by Carlos Monasterios, Scott Elbert, Ramon Troncoso and Luis Vasquez. The Royals will send left-hander Jeff Francis to the hill. 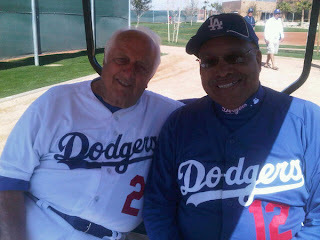 THAT’S MR. DAVIS TO YOU: Dodger legend Tommy Davis will throw out the ceremonial first pitch this today after spending the past few days at Camelback Ranch working with the minor leaguers. The Brooklyn native played eight seasons with Los Angeles from 1959-66, batting .304 with 86 home runs and 465 RBI in 821 games. 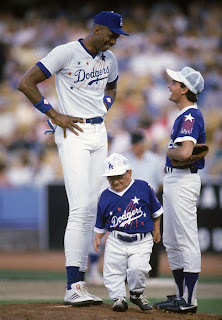 ON THE DOTTED LINE: Today, the following Dodgers agreed to contacts for the 2011 season: Ivan DeJesus, Scott Elbert, A.J. Ellis, John Ely, Javy Guerra, Blake Hawksworth, Jamie Hoffmann, Kenley Jansen, Clayton Kershaw, John Lindsey, Jon Link, Russell Mitchell, Carlos Monasterios, Xavier Paul, Trayvon Robinson, Travis Schlichting, Ramon Troncoso and Luis Vasquez. The Dodgers also renewed the contract of Ronald Belisario and placed him on the restricted list. START ME UP: Los Angeles dropped a 2-1 decision yesterday against the Indians in Goodyear, but the club continued its stretch of impressive starting pitching with Chad Billingsley striking out three in 3.0 scoreless frames. In five games, Dodger starters Billingsley, Clayton Kershaw, John Ely, Hiroki Kuroda and Tim Redding have yet to allow an earned run (one unearned) in 11.0 innings. HAPPY DAY: The Dodgers would like to wish outfielder Jay Gibbons a happy 34th birthday as he makes his first Spring Training appearance as the designated hitter today against the Royals. The eight-year Major League veteran batted .280 with five home runs and 17 RBI in 37 games for the Dodgers last season after starting the season with Triple-A Albuquerque. PAYING RESPECTS: A private memorial service for Hall of Famer Duke Snider will be held on March 12. In lieu of flowers, the family has requested that donations be made to the Fallbrook Union High School Baseball Program c/o Fallbrook Baseball ASB, 2234 S. Stage Coach Lane, Fallbrook, CA 92028. ENTER SANDS MAN: Yesterday, Jerry Sands launched his first home run of spring onto the left field berm in Goodyear. The slugger had a breakout season in 2010, earning the Dodgers’ Branch Rickey Minor League Player of the Year Award, a selection to the Baseball America Minor League All-Star Team and an outfield spot on Sporting News’ All-Minor League Team after tying for third among all minor leaguers with 35 combined home runs with Single-A Great Lakes and Double-A Chattanooga. The 23-year-old has played 164 games in the outfield, 84 at first base and one at third base in his three-year professional career. B.A.T.-TER UP: Tonight the Dodgers will be presented with the Bobby Murcer Award at the Celebrity Ball for B.A.T. (Baseball Assistance Team) as the club was the largest contributor to the fund via payroll deduction. The team will be represented at the gala at Talking Stick Resort in Scottsdale by General Manager Ned Colletti along with Special Assistants Bill Mueller, Rick Ragazzo and Aaron Sele. ONE FISH, BLUE FISH: Tomorrow from 12:30-1:30 p.m., A.J. Ellis will read to local kids, ages 6-10, at Glendale’s Main Library (5959 W. Brown St.) as part of a celebration of Dr. Seuss’ birthday and to promote literacy. Ellis will be joined by White Sox pitcher Chris Sale at the event. “B”-ATTER UP: The Dodgers and White Sox will play a “B” Game tomorrow morning at 10:00 a.m. on the White Sox side of the facility. The Los Angeles team will be comprised of entirely minor leaguers. PUT ME IN COACH: Tomorrow marks the Dodgers’ annual open tryout in which any ballplayer can come to the fields and attempt to earn a minor league contract. Registration will begin promptly at 8 a.m. with the tryout taking place at 9 a.m. Players just have to bring their own uniform and then dazzle the staff. The Dodgers signed two players out of the tryout in both 2009 and 2010, including right-handed pitcher Tim Corcoran, who is still in the organization. A LITTLE SHIFTY: Former Dodger second baseman Steve Sax will be at Camelback Ranch-Glendale this weekend to promote his new book, SHIFT: Change Your Mindset And You Change Your World. The All-Star infielder will throw out the first pitch on “Fireworks Night,” Friday, March 4 prior to the Dodgers’ 7:05 p.m. home game against the Gi­ants. The following day, Sax will be signing copies of SHIFT outside the Team Store in the Center Field Courtyard from 11:30 a.m.-2:30 p.m. Sax won the NL Rookie of the Year in 1982, the Silver Slugger in 1986 and was a five-time All Star for the Dodgers (1982-83, ’86) and Yankees (1989-90). BALANCING THE BABY BOOKS: The Dodgers would to like to congratulate team finance wiz Luis Banuelos on the birth of his first child, Iris Alessandra, on Monday. April is just around the corner. 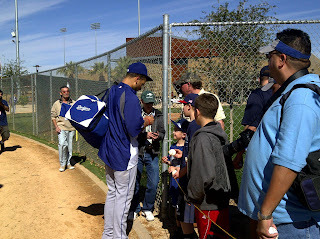 Goose Joak makes a Matt Kemp card for 2011. It's definitely worth a look. Night Owl Cards shows some under-appreciated Duke Snider Baseball cards. Here's a sneak peek look at 2011 Allen & Ginter Baseball, via Beckett. 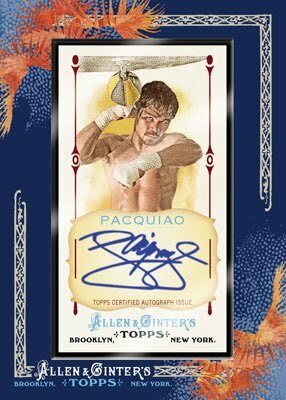 I am definitely going after this Pacquiao auto. peanut butter, jelly, macaroni and cheese, wasabi, chocolate chips and pineapple. 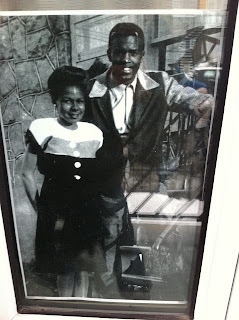 Here's a peek at Jackie Robinson's apartment that was recently commemorated in Montreal. 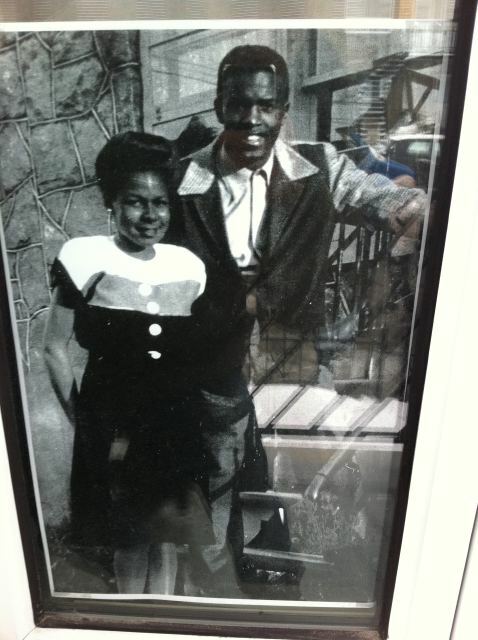 Below is a pic of a photo that sits along side a plaque. (Pic Link: Yfrog) Here is a google street view of the apartments here. A Globe and Mail story about it is here. Check out the Orioles new digs in Sarasota. It looks awfully nice, and is no doubt a huge step up beyond their old home in Ft. Lauderdale. That place was wretched.